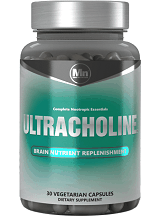 This is a review for ULTRACHOLINE and is to be used to help you learn the significance of this product. The manufacturer states that this product has the ability to improve your memory as well as your mood while also keeping anxiety down and eliminating brain fog. More information is listed below in regards to the effectiveness of this supplement. As a dietary supplement, take 1-3 capsules between meals to accelerate acetylcholine replenishment and synthesis, promote receptor growth and optimize essential brain nutrient levels. Do not exceed six capsules in any 24 hour period unless otherwise directed by a healthcare professional. The price for one bottle of this supplement is $20.95. This product has little to no side effects that come with it. Unless you are allergic to any of the products. If you are under the age of 18 you should not take this product without consulting a doctor. If you are pregnant or nursing you should not take this product without a physician’s instructions. If you are currently taking any other medications you must consult with your doctor beforehand in order to prevent any side effects. If you do experience any side effects, discontinue use and call your doctor immediately. After doing extensive research on the manufacturer’s website as well as the internet, I was unable to locate any information regarding return policies or money back guarantees. Before you purchase this product it would be wise to contact customer service to find out if there are any such policies and what they consist of. ULTRACHOLINE seems as though it could be a very effective product when it comes to memory enhancement. This product is made of all-natural ingredients which means no harsh chemicals are getting into the body. It is also low cost so there is little risk involved when making a purchase. No information regarding return policies or money back guarantees could be found. This could indicate that the manufacturer is not very confident in the product enough to make this information public. There were very few reviews found regarding this product which could indicate that it is new to the market and has yet to be experienced. Once there are more positive reviews about this supplement, it will increase the possibilities for this manufacturer.